The Festival Hotel Apartments Karlovy Vary is situated on a hilltop that affords it a view of the city below. Attractions located proximate to this hotel include the nearby St. Mary Magdalene Church. The Festival Hotel Apartments Karlovy Vary may be reached via the Karlovy Vary International Airport which is located roughly 3 miles from the town center. 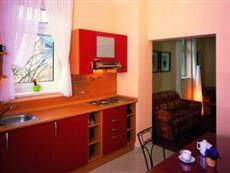 The Festival Hotel Apartments Karlovy Vary is a provider of apartment-style accommodations. These are large facilities and there are seven of them available for hire in total. Each apartment contains a kitchen with all the appliances necessary for guests to prepare their own meals. There is also a separate sitting room and bathroom in each apartment. In-room amenities include satellite television service and a safe deposit box. These accommodations are rated as four-star level lodgings. The Festival Hotel Apartments Karlovy Vary provides its guests with access to amenities which include a spa center. The hotel also has a restaurant on the premises where guests may take their meals. The reception area provides check-in and check-out services.